Update: This card has been discontinued, you can check out my other favorite cash back credit cards. Do you use a rewards based credit card for the points? I know I do. Have you ever wondered which credit card gives you the best bang for your buck? That’s one thing that I always look for, the best value for your dollar. I do that whenever I’m in stores, restaurants and especially when buying a stock. Picking a credit card to use is no different and after doing some extensive research, I have found a credit card that I carry in my wallet to this day. That card is the MBNA Starwood Preferred Guest (SPG) Credit Card. Why do I like the SPG credit card the most? Simply because it gives you a great return on your spending, it has NO annual fee with free supplementary cards, it includes a comprehensive insurance package and they have a super fast online system (updates within minutes of transaction). SPG is a HOTEL points program that gives you points towards staying in Sheraton, Westin, 4 points, Luxury Collection, St. Regis, Meridien, and W hotels. SPG has been winning awards for many years now as the best rewards program out there. What’s really great about this program, unlike other travel programs, is that the points can be used anytime. That is, there are no blackout dates. How many points do you get for using the SPG credit card? 5000 bonus points for every $10,000 that you spend for up to 15k bonus points ($30k spent). For example, if you spend $30k in your first year and get all of your bonuses, you can obtain 40k points which is enough for 4 nights in a category 4 hotel (middle-upper class). After your first year, you get around 1 pt for every $1 that you spend up to $30k. After $30k spending, you only get 1 point for every $2 that you spend. Return on spending: $480/$10000 = 4.8% RETURN ! This kind of return is a bit on the high end but I typically get around 2.5%-4% return / redemption. Their point system also has a bunch of great features like cash and points, 5th night free and SPG to airline point conversions. The cash and points system (one of my favorites) is where they let you combine cash and points towards selected SPG hotels who join the program. It’s really great for people who don’t have an obscene amount of points but want to stay at SPG hotels at a substantial discount. The 5th night free is just that, book 5 nights with any of their hotels on points, and you get the 5th night free. So if you booked a Category 4 hotel for 5 nights, it would cost you 40k points instead of 50k. Their SPG to airline points transfer system also offers generous perks where they give you an additional 5k points for every 20k spg points that you transfer. They support a large number of airline point programs (except Aeroplan) :(. Some other features as mentioned before is a comprehensive warranty/insurance program which includes travel accident, car rental, and purchase/theft insurance along with double warranty on purchases (for up to 1 year). 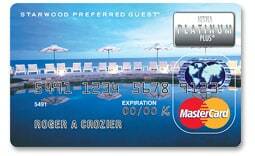 This card is best for those who like to travel and spend up to $30k on their primary credit card every year. If you don’t pay off your credit cards in FULL every month, this card is NOT for you. They charge around 20% interest/annum. It may sound like I work for MBNA and even if I did, it would be easy to push this product. But alas, I’m just a regular Joe trying to get the best bang my buck, and the SPG credit card is on top of the rewards (no annual fee) credit card list. Interested in getting this card? Unfortunately, the MBNA SPG credit card has been discontinued. Does anyone know of a card that pays points on cash advances ? I’ve read on the redflagdeals.com personal finance forum that the TD cashback visa gives you the cashback when you use the cash advance cheques. However, with that said, it is only beneficial if they DON’T start charging you interest from day 1 like most cash advances. It’s only beneficial if you can pre-pay the credit card & don’t pay a cash advance fee, then you pay no interest on the advance, yet earn the points on what would otherwise be a cash transaction. Ah Mark, I see that you’re thinking. :) I was a little concerned at first because cash advances are generally considered a no-no. Is the 4.8% return on 362USD take into account the hotel’s retail price or the price from a discounter (Expedia.com, Orbitz.com)? I would be interested on how the rate of return compares using the discounted price. Or better yet venturing outside the Starwood hotels for a comparable on-sale hotel stay. Something tells me the 4.8% might be less. The 4.8% is by no means a guaranteed return, it is actually on the high end from my research. From my personal point claims, I have averaged around a 3% return. The prices listed on SPG.COM are the lowest possible prices (besides priceline). If you find a lower price, SPG will give you the lower price plus some extra points on top of that. 3% and price matching, sounds like a sweet deal indeed. Looking at the spg.com site, they may have changed the terms. The Amex has a $30 annual fee after one year, and earns one point for each dollar spent, and 10,000 bonus points for a new card holder. Am I looking at the right card? Ah, I see, you are looking at the American cards. The MBNA SPG Mastercard is a Canadian card which has no annual fee. I’m not too familiar with American credit cards, but i’m pretty sure that there are a lot more competitve credit cards there, so i’d do some more research before choosing your primary card. I’ve read somewhere that there are 3% cash back cards in the states? If we had those here, I would be ALL over it. I have this card to, and pretty happy with it. Only issue I have is the purchase protection insurance. in short,Had bought an electric kettle and within a month it was damaged by someone accidently putting it on the stove and melted the bottom. Tried to get this covered by the purchase protection plan, they came back to me and said (Can’t remember the exact words)this sort of carelessness is not covered. wat the #$%!! Isn’t this a frikin purchase protection plan, which covers “ACCIDENTS”! ? It’s not like I’m scamming them or something. I’m just pissed about the ins company, and think this portion of the credit card is bull! pennypnchr, that’s unfortunate that they didn’t cover you. When you tried to make your claim, did you call MBNA directly? Or their affiliated insurance company? Was the original receipt required? The only concern for me about these kind of point cards is the actual calculation of the return. The real return for me would be the cost of a hotel where I will vacation (mostly Florida) which may include Starwood. The problem with SPG is that the vacation club or Sheraton Vistas in Orlando do not accept SPG. Meanwhile, I can get a Marriott Vacation Club sometimes in the price range of $200 for a one bedroom or even less using Priceline which can land me in the Gaylord Palms for example. Besides, around $20k per year is about what I can put on credit cards these days. I had the CT Cashback card when it was 3% and held on to it even when it dipped to 1%. Now I have the AMEX 2% cash back card. I find with the Amex though, at least 10 to 15% of my purchases are at places that do not take AMEX. But the extra 1% over any MasterCard makes it still the better choice. My backup credit card is a PC MasterCard. I guess I really should look into what’s the best credit card for purchases under $2-3k per year. I looked into the SPG American Express Credit card and it is not available to canadians…….how did you go about getting the card? starwood does let you transfer to aeroplan too, I think; just made my first purchase with this card! Hussein, they will allow you to transfer your spg to aeroplan IF you earned the SPG points through hotel stays only. Points earned via the mbna spg mastercard cannot be transferred to aeroplan! I must concur with your review of this card. I have tried many many cards over the years, but I continue to use my SPG Mastercard for all my purchases for all the above mentioned advantages. Quite simply the best card there is…so far. Using a tent, poles, and firewood would save you much more than wasting money on hotels. What is with the lie on your Outlook Financial banner ad stating 5 percent GIC by the way, Frugal Trader? Outlook Financial should be courteous enough to update their banner ads in an honest manner. GIC interest rates have gone down quite a bit lately. Because of the lie, I will have to call up Outlook and demand they give me the 5 percent rate today, or else. new note – I had referred a few friends to this card, and it seems the insurance benefits have been withdrawn. I’ll likely need to check with them to see if my rental insurance was grandfathered, but you may want to change that the next time you update this page – still the best card in Canada, I think (and discovered through this site! ), but by a little bit less. Hussein, are you sure about that? I haven’t received any notice that they have withdrawn their insurance benefits. Perhaps it’s with the non-platinum version? Hussein, your friends must be applied for the regular spg card and not the platinum. Car rental insurance, purchase assurance, extended warranty all still apply to platinum cards. I looked at the MBNA site today, and they don’t advertise the car rental insurance anymore. My friends who were looking to open the account were told by a representative over the phone that there is no insurance included in the card. When I opened my account just over a year ago, the insurance was still a feature included in the card, and I also haven’t received any notification to say it’s not included anymore. I’ll let you know if I hear anything further. I’ll let them know. Thanks for following up. Does the SPG rewards transfer to flight with Air Canada and Westjet? Jay9, my understanding is that you can only transfer spg pts to aeroplan IF the points are accumulated via hotel stays. Points accumulated via credit card transactions are not transferrable due to VISA/CIBC’s relationship with Aeroplan. Good news for you FT and others wondering. The restrictions on Aeroplan has been lifted from my last recollection. You can now transfer points to it like you would any other program using your SPG points. If you do a search on RFD and read through the thread there you will most likely find confirmation of this. I think that’s where I got my info from. This card has been discontinued. Existing cardholders will be able to earn points through to Feb 2010. SPG will supposedly announce a new Canadian CC relationship in the coming months. SPG Mastercard is the best. 1) Rate of return can be as high as 7% if you stick to catregory 1 and 2 . I have done this a few times. 2)Also if you have a spouse I suggest the following. Get one in each of your names. Husband to be a primary and wife to be a primary card holder. 3) If the SPG account for the husband is short soem points, one can transfer spg points from the spouse at no charge. That is a heck of a feature. Charlie, did you not read the post just a bit above yours? The card is discontinued and existing cardholders will be cut off next February. I received a letter from MBNA yesterday announcing their SPG card would be discontinued. I then did a quick web search looking to find out if the new SPG credit card for Canada had been announced. I found the following link where you can sign up to be informed of the new SPG Credit Card when it is announced for Canada. I received a letter from MBNA yesterday announcing their SPG card would be discontinued. I then did a quick web search looking to find out if the new SPG credit card for Canada had been announced. I found the following link where SPG announces that the new credit card for Canada will be from American Express. You can sign up to be informed of the new SPG Credit Card when the details are announced for Canada. You must apply for the Card using the Apply Now links in this email, and enter RSVP Code 11000 when prompted. Earn more Starpoints faster — receive 1 Starpoint for every CDN$1 in purchases charged to the Card.3 That’s in addition to the Starpoints you earn at Starwood Preferred Guest hotels as an SPG member. Receive travel and retail insurance protection such as Travel Emergency Assistance,6 Travel Accident Insurance7† and Car Rental Theft and Damage protection,8† and much more. I’m totally shock and disappointed with the annual fee. I have called SPG more than once with minor concerns and they have given me the Gold status for a year. Previously $30,000 would have compensated me with 15,000 points. The Gold status doesn’t cost SPG anything. A month ago we stayed at the Imperial Palace for $25.00 a night not a Sheraton property but it worked. Now SPG executives do the math $120.00 annually, I’m paying for your free night. I just book the Walt Disney Dolphin; it took years to accumulate the points. If I had a $120.00 annual fee it would have been cheaper to stay at the Disney’s value resorts. Thank you and goodbye Starwood. Next post: Deal of the Week! Air Canada Unlimited Flights!